Martin Luther's revolutionary stand against the 16th century papacy revived the authority of God's word and reshaped the religious landscape of Europe. In this volume, fifteen scholars led by R C Sproul and Stephen J Nichols examine the enduring influence of Luther after five centuries. 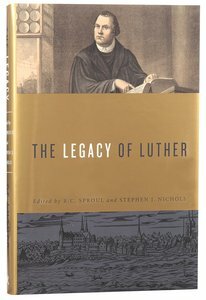 About "The Legacy of Luther"
Stephen J. Nichols (Ph.D., Westminster Theological Seminary) is a professor at Lancaster Bible College and Graduate School. He has written several books, including in the A Guided Tour series including Pages from Church History: A Guided Tour of Christian Classics, J. Gresham Machen: A Guided Tour of His Life and Thought, Jonathan Edwards: A Guided Tour of His Life and Thought, Martin Luther: A Guided Tour of His Life and Thought and An Absolute Sort of Certainty: The Holy Spirit and the Apologetics of Jonathan Edwards. He lives with his wife and two sons in Lancaster, Pennsylvania.